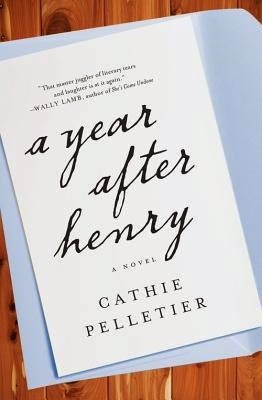 With her trademark wit, Cathie Pelletier has crafted an elegant, uplifting portrait of the many strange and inspiring forms that grief and love can take in the journey to overcoming loss. For some reason, the books I've read lately have all had some sort of common thread--dead spouses, dead spouses' mistresses, messages from the other side, etc. A Year After Henry falls right into that pattern. Because I've been reading so many similar books (purely by coincidence), I was a little burned out by the time I came to this book. First off, though, I have a pet peeve that really doesn't have anything to do with the book or the author. The summary given for this book is a bit misleading. While I wouldn't call it a bait and switch, I will say that the book I read was not the book I was expecting based on that summary--however, that is probably a good thing. I did enjoy Pelletier's writing. I felt that she successfully rounded out her characters are conveyed their place in the grieving process--after all, this book was all about grieving. My favorite character, and one of the main characters, was Henry's brother Larry. Like the other two main characters (Jeanie and Evie), Larry is dealing with the grief of losing Henry, but also with the grief of losing his previous life. I believe there was enough there about Larry that Pelletier could have written just about him. My biggest complaint with this book was with the handling of the character of Evie. She was interesting--a pot-smoking medium / bartender who was Henry's one time mistress. However, she really didn't fit in to the overall scheme of the book they way a character carrying that much weight of a book should. I wish Pelletier had either tied her in more to the stories of Larry and Jeanie, or minimized her role in the book. Overall, I would say this book is fine, but not exceptional. It might be a book I would recommend to someone who might relate to its subject matter, but probably not to anyone just looking for an entertaining book to read.